Rental Rates Are Higher Than You Think! As real estate investors, I find that we’re always swimming upstream (that is, metaphorically speaking). We’re always trying to go against the current because what we do is oftentimes out of the ordinary. Unique. Different. Sometimes even considered weird and strange. Mortgage Classification – Where Do you Fit In? New CMHC consensus numbers indicate that only about 3-4% of mortgages are classified as “investments”. This means that out of 100 mortgages, 97 are likely going to be “owner-occupied”. Having your mortgage classified as an investment is difficult to accomplish, both mentally and financially, because everything is against you. You’re never going to read a headline that is positive about landlords or see headlines indicating that it is a safe time to invest in real estate. You will always be going against the norm, but when you do it successfully, you are well-rewarded. When Everyone Zigs, You Zag – Everyone focuses on the sale price, but as investors, when everyone is zigging, we need to be zagging and monitor the rental market to make sure that our numbers work. 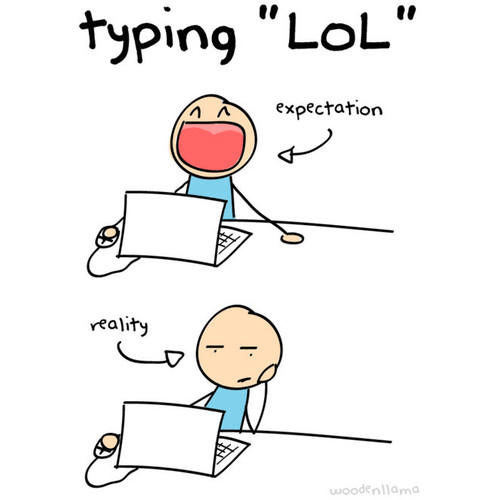 Expectations Vs. 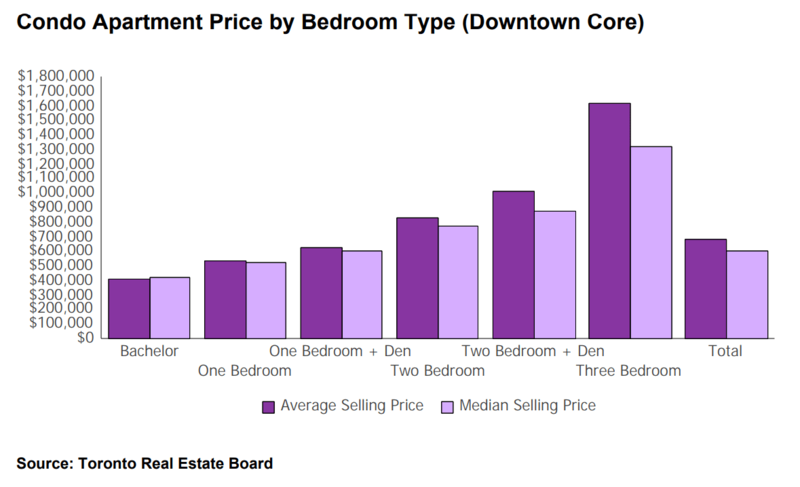 Reality – Recently, I’ve had a lot of first-time investors express to me that, “You can’t get that kind of rent for such a small condo downtown, for that price point!”. In those situations, I’ve had to politely course-correct their expectations. Landlords Are Laughing – The rental market is, for a lack of a better term, ridiculous! Landlords are the winners in this type of market. The downward pressure from the stress test, priced out buyers, and the lack of inventory in rental units have created this perfect storm of ridiculous rental hikes. The amount of money that people spend on housing hasn’t changed much over the years, but what has changed is the size of this housing. Have you noticed that chocolate bars are still a $1.25, but they have been getting smaller over the years? I know… unbelievable, right?! Recent Revelations – In this week’s Insight Article, I have some charts from some recent studies that I wanted to share with you that will knock your socks off! First, let’s start off with a 300,000 mile high bird’s eye view of Canada. 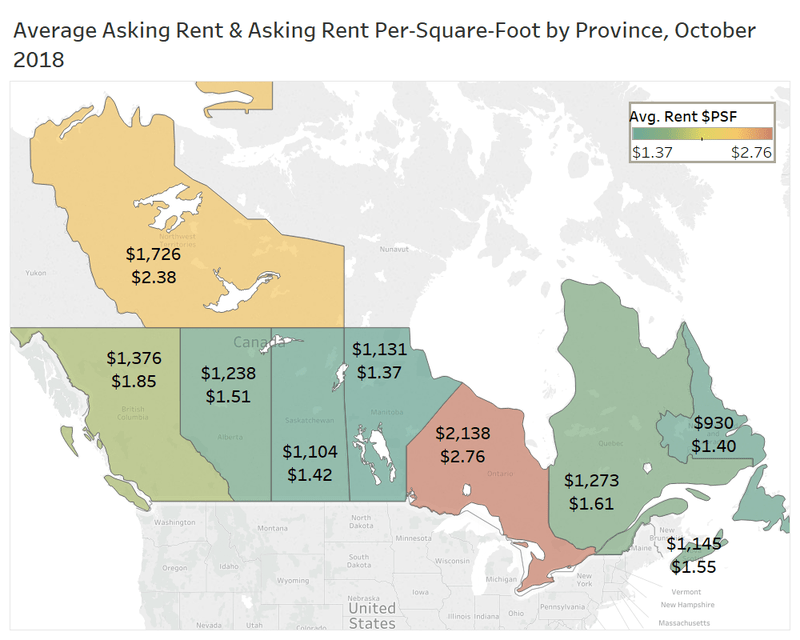 Ontario On Its Own – With rental rates at $2.76 per square foot in Ontario, that is the highest rate in all of Canada. Let’s just say that Ontario is in a whole league of its own. 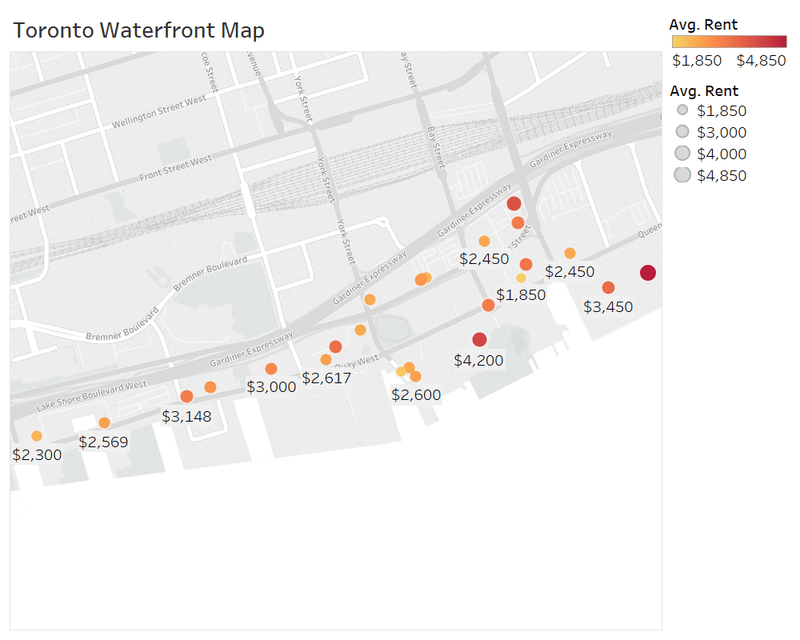 According to Rental.ca, you can see below that the average 1-bedroom condo is priced starting at $2,466/month. That number is higher than renting a single/semi-detached home! Just take a look at the graphs below for more details. 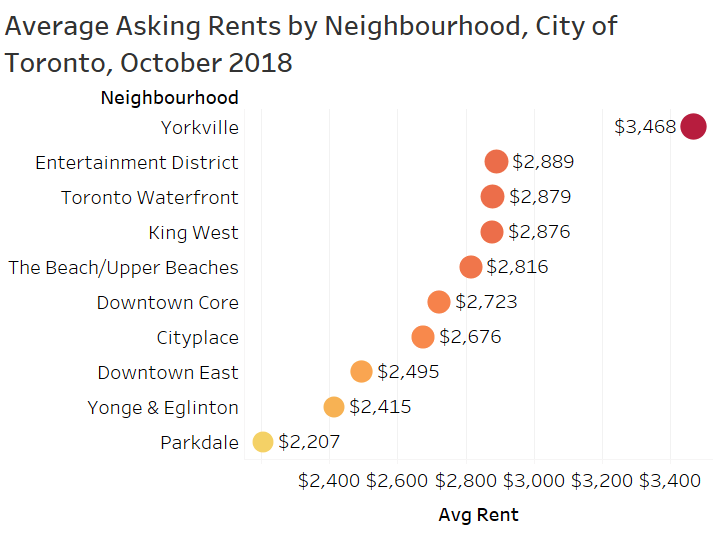 Breaking it down some more, you can see the average rent in each Toronto neighbourhood in the chart below. 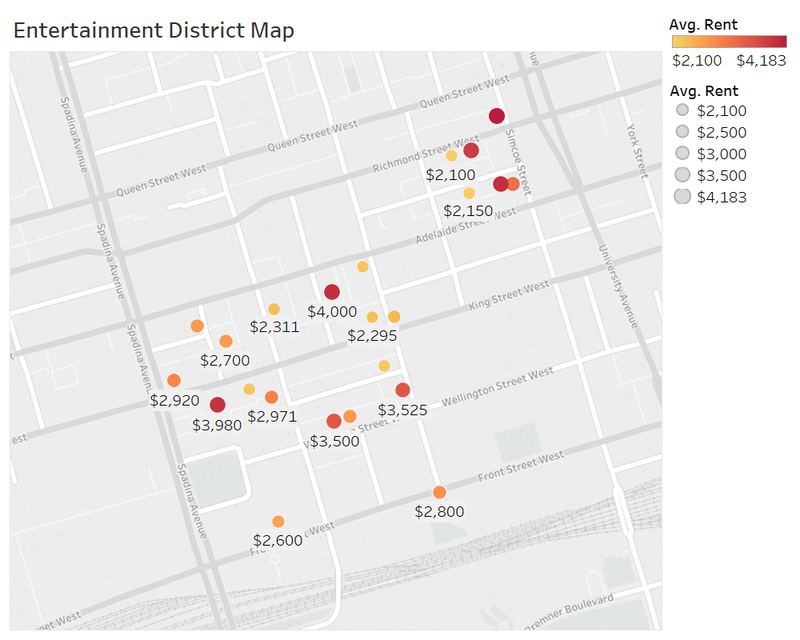 The Big Three – From the chart above, you can see why I have been putting such a huge emphasis on investing in neighbourhoods such as the Entertainment district, Waterfront and King West areas. As a reminder, that’s where a lot of the tech money will be headed to! Here is a breakdown of the top 3 neighbourhoods from the previous chart and the average rent in each building of each respective neighbourhood. If you’re an experienced condo investor, you will know exactly which buildings are yielding the $4,000/month rent. Those numbers above are crazy right?! Many people cannot even comprehend paying more than $2,000 per month in rent to live downtown, let alone a 1-bedroom unit for almost $2,500 right now. What About The Others? So far, we’ve highlighted the downtown areas for the most part because so much of the growth in Toronto is happening in those areas. However, there are also a lot of other condo areas in Toronto that are in high demand as well. The spillover from the downtown core is real. 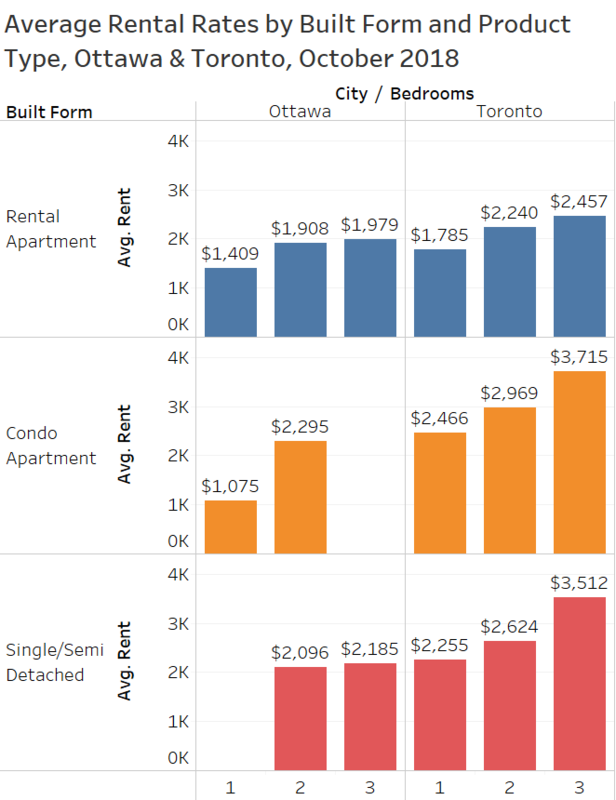 Take a look at the graph below for the average rent of 1-bedroom units across the GTA. 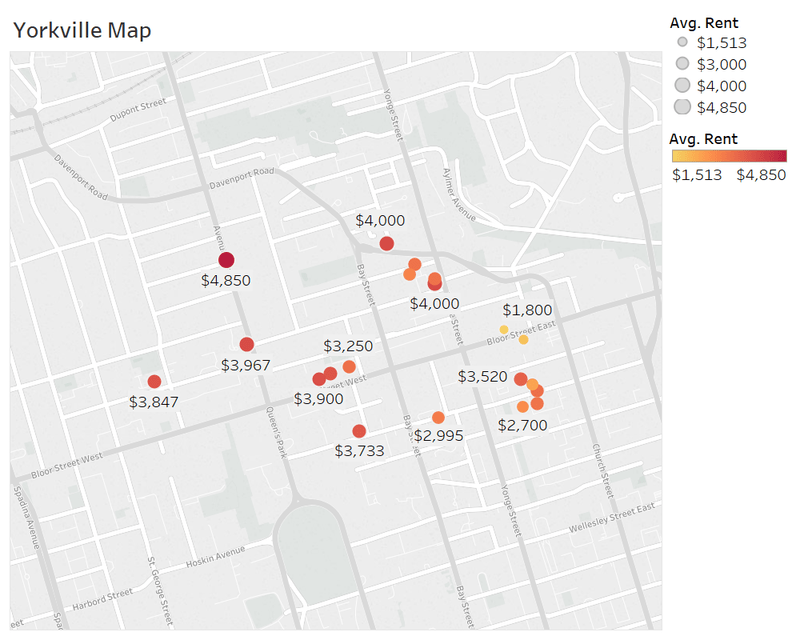 Mind the Gap – As you can see in the graph above, nothing (on average) is less than $2,000 right now, irregardless of where you are in the city. Also, do you see the gap between the 2 purple bars? Dark purple is 2018 and light purple is 2017. That gap represents a 10%+ increase in every area, across the board! From the Trading Desk – If you are curious to see what price downtown condos are trading at these days, take a look at the numbers below (stats include numbers up to the end of October 2018). Shrinking in Size – You can see that the 1-bedroom units downtown are getting really close to the $600,000 mark. Again, what people can afford doesn’t change over the years, but what they can afford becomes smaller. I wouldn’t be surprised if bachelors become the new entry-level product at $500,000 in the coming years. 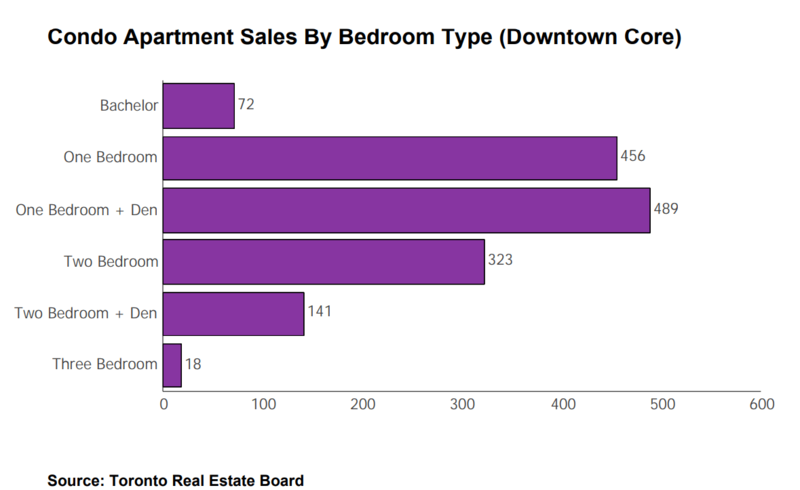 One Bedrooms Take the Cake – The following is a breakdown of sales by unit type in the downtown core. 1-bedroom units (including 1+1’s) make up more than 60% of all sales, with 1+1’s trading in the $550,000-$700,000 range (which is what the above-average Torontonian can afford). Furthermore, from the chart above, we can see that there were a total of 1,499 condo units that were sold by adding up the sales from each unit category. Supply Speaks – Now comes what I think are the most interesting graphs – the supply of rentals. 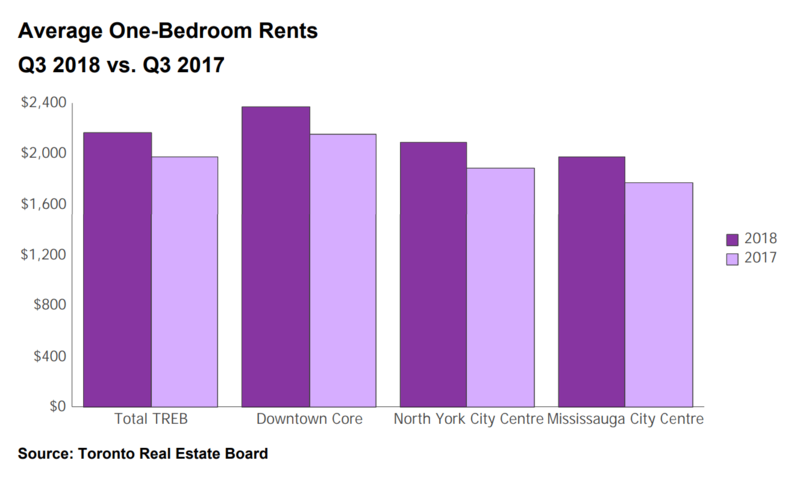 Have a look at the graph below to see how many properties in Downtown Toronto are being rented out in Q3 2018. 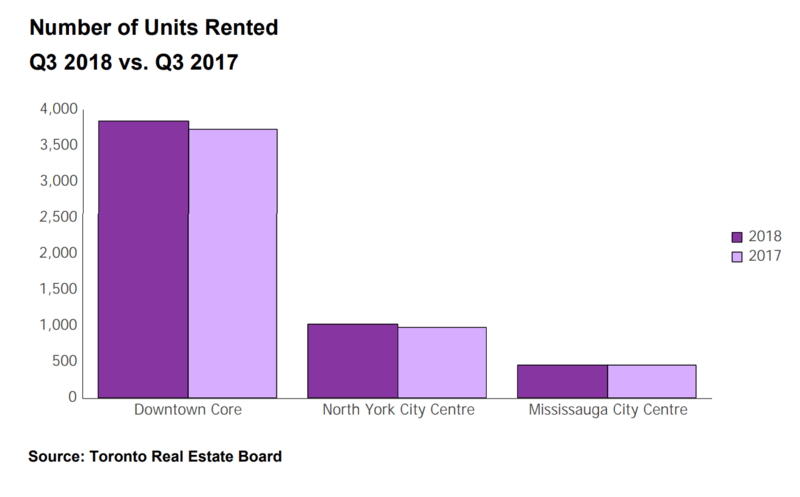 Per the graph below, that’s close to 4,000 units being rented out in the Downtown Core, which is 4 times the amount in North York and almost 7 times the amount in Mississauga! Wait A Minute… What?! 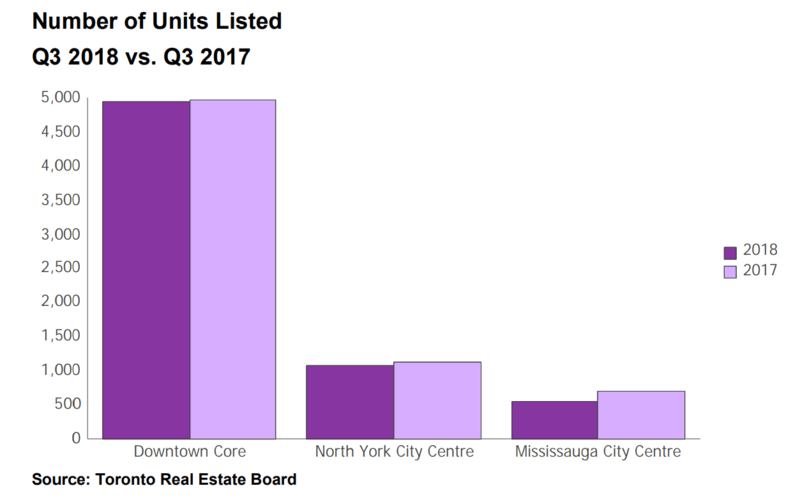 There are close to 4,000 units being rented out in the Downtown Core, but from the chart prior to the one above, we saw that there was only a total of 1,499 condo units that were sold in the Downtown Core. Crazy isn’t it? The number of units being rented out is more than 2.5 times the number of units being sold! Oh, and here’s the kicker to all of this as well. Take a look at the chart below. More properties were listed for rent in 2017 than 2018, but we had more units rented in 2018 than 2017. This tells us that the supply is tightening very fast in the rental market right now, even despite prices being up 10% from last year. 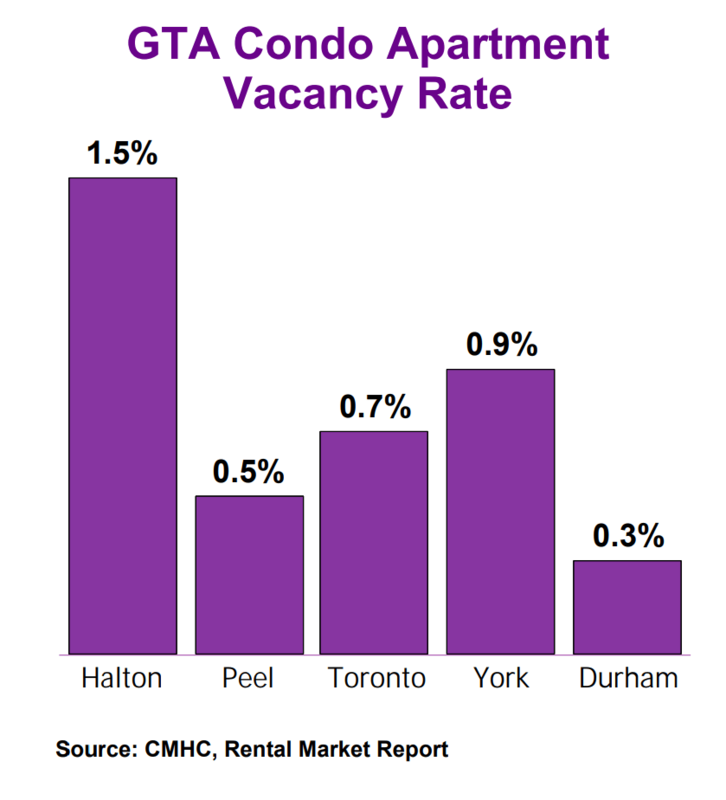 No Vacancy – The final chart that I wanted to share with you is the vacancy rates in the GTA condo market. Looking across each region in the GTA, not just downtown, every region has a vacancy rate under 1%, with the exception of Halton. Keep in mind though, even at a vacancy rate of 1.5%, that is incredibly low despite it looking very large on the graph above (it’s all relative). The Wrap – We seriously are in a rental crisis with the number of rental listings going down, the number of units rented going up (despite a 10% increase in rents), and the vacancy rates at an all-time low in the GTA. 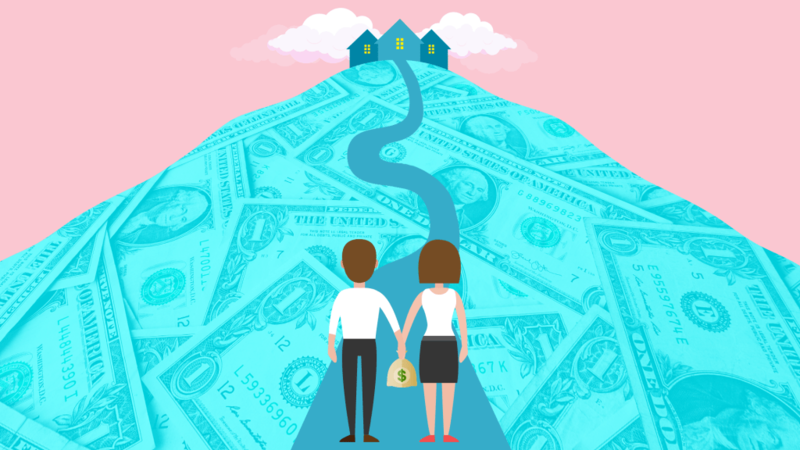 Investors, if you can make your investment cash flow positive, then owning a rental property is a no-brainer right now. Combine that with the lack of supply PLUS the slow down in condo developments, this is a golden opportunity to be owning real estate! If you don’t own any investment real estate right now, I would highly recommend for you to consider picking one up before it becomes even more unaffordable. Give us a call to see what type of cash flow positive asset class works best for you! Previous Previous post: TINDER for Real Estate? !